This service is one of the best ways to improve your homes curb appeal. This service is highly recommended for homeowners looking to improve looks before selling a home, or new homeowners who just bought a home. The pictures show the difference a little cleaning makes. 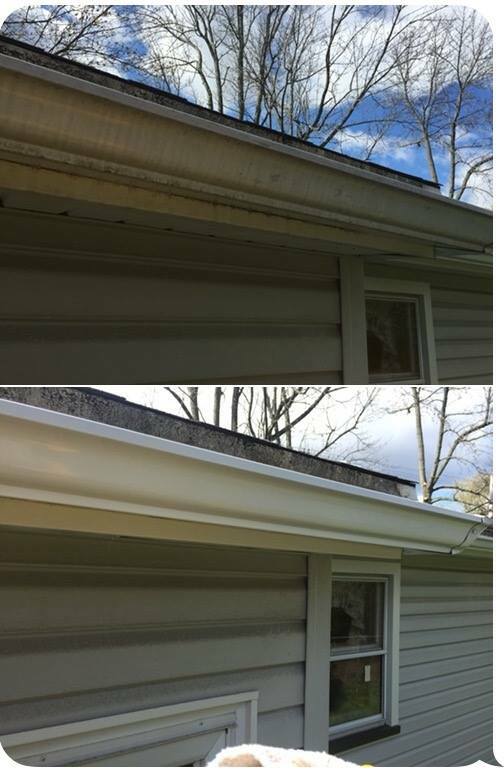 If you are thinking of replacing your gutters because they look old, worn down and ruined, call us, and see if we can restore them before you replace them. The first step in this process is to clean the inside of the gutters. This will prevent water from spilling over the edge of the gutter allowing mold and mildew to grow on the outside of the gutter. Once the inside is clean we then move onto the outside. We take an environmentally safe cleaner and spray it along the outside of the gutter and allow it to sit for a few seconds to loosen up the dirt. We then take towels and wipe of the dirt and grime. The cleaner we use is safe for all types of plants and not harmful to pets or children. Sometimes we have to repeat this process to remove all of the dirt. We would like to let everyone know that there are times that the finish of the gutter is so weathered that this service will not help the looks of the gutter. This process is also quite time consuming. For this service we charge by the hour, it usually takes 2-4 hours depending on how dirty it is, and how high up it is.